The UK manufacturing sector had been weakening along with the global economy. 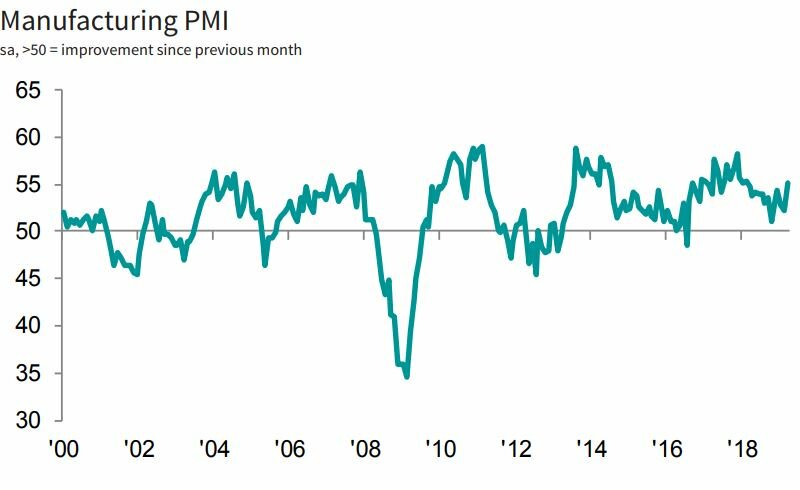 On Monday the Markit final UK March manufacturing PMI came in at 55.1 vs 51.2 expected boosted by stock purchases ahead of Brexit hitting a G-7 record. "The impact of Brexit preparations remained a prominent feature at manufacturers in March. Efforts to build safety stocks led to survey-record increases in inventories of both purchases and finished products. Trends in output and employment also strengthened as stockpiling operations at clients led to improved inflows of new work." The trend in manufacturing output improved in March. Companies stepped up production to build-up inventories in advance of Brexit and also meet rising inflows of new work (mainly reflecting stockpiling at clients). New business improved from both domestic and export markets. This had a positive impact on staff hiring, with jobs growth recorded following back-to-back reductions at the start of the year. The rate of increase in stocks of purchases hit a surveyrecord high for the third month running in March. The three sub-industries covered (capital, consumer and intermediate goods) all saw inventories rise at series high rates. A similar story was told for stocks of finished goods, which rose at a record pace for manufacturing as a whole and at, or close to, record highs across the three product sectors. “Businesses on both sides of the channel intensified their efforts this month to accumulate materials with the fastest increase in the stock building of finished goods since 1992, as the UK hurtled towards the Brexit deadline. “Firms attempted to guarantee certainty of supply, lock in good price deals and protect their operations from withering under the pressures of uncertainty as new orders from domestic and export markets such as mainland Europe rose at their fastest rate this year. Supply chains paid a heavy price for this spike in activity as delivery times increased again and suppliers under the cosh for raw materials and finished goods struggled with demand and transportation issues. “This panic-buying had a marginally positive effect on job creation however, as increased Brexit preparations required more hands on deck and some businesses were carrying on regardless launching new products and markets. “The big worry is if the threat of uncertainty recedes, businesses will have to resort to heavy discounting on these stocks to free-up valuable operating expenses if normal order levels are not restored in the coming months. With higher price inflation continuing to gnaw away at margins and businesses paying more for energy and raw materials, the economic burdens could deepen and job hiring strategies re-examined."